1) I have no idea how the current system was determined, but it needs to be changed. I would bet money that if the A and B divisions were combined that not a single 16 year old team would make it to state. 2) You want to see players develop throughout the season and I'm not convinced that is happening in the A division. Most of the 16 year old teams should be in the B division. 3) Why are teams like Thompson, Langdon, Carrington and Velva in the B division? 4) It would sure be fun to see more of the A and B teams playing the AA teams. 5) Why can't the top A and B teams have an opportunity to attend an advancing tournament? I can't take issue with any of your points. This attempt at a 3-class system is absolutely misguided and I feel could actually be taking away from summer participation ( I mean, look at the geographical footprint of the Class B SW region, for example). If you look at the A and B state tournament lineups, IMO there really is no talent gap, depth differences, etc. So what is it trying to accomplish? This whole realignment thing starts and ends with where to put the 16 yr old teams. But really in my experience it was a vocal minority getting their way. Go back to 2 divisions, throw the 16 year old teams back in the lower division and deal with it. Class B teams managed to compete with them back in the day, certainly they can now. Go back to 2 divisons and bring some sanity back into Regional alignments and don't let our kids spend their entire summers on a bus. The reason for the three classes was to bring about balance in teams competing in the state and not having larger towns dominate smaller towns year in and year out. Here in Northeast district Grafton had won the NE region like nearly every year. I am not saying there are not couple of teams that could be in upper level of class A. The towns of Langdon and Carrington have good programs but by no means do they have numbers to compete with any class AA team. Langdon legion team is made up several Baberuth players that play and start for them. Carrington is similar to Langdon with maybe a little more depth but not teams made up older kids each year they rely on younger kids to make their teams. Thompson I think is on the cusp of being class A team because of where they can draw their kids from close to metropolitan area and the depth they have shown over the last few years. This having depth and mature players is even more needed today than when they started the third class because the new rules on pitch counts has put depth primary concern for teams competing. Pitching was always limiting factor and now with pitch counts the need for more pitchers is must. The difference between class A and class b teams is the depth at pitcher where usually a lot of class b town may have up to three older experienced pitchers then you start getting to younger pitchers even to where they may even be baberuth kid pitching. The larger towns just have depth of having numbers to have depth at pitching. I have not heard of many complaints here from class b teams and they seem to like how its structured now. The complaints seem to come from the Class A teams and I believe its because being competitive division winning and going to state in not as easy accomplishment as it was when they were with combined class b and class a field. I believe it helped some smaller class b towns keep programs going because the kids feel they have chance to win where before they were just getting beat up year after year felt they had no chance. At this point I just don't see where they are going to change this tournaments are popular and even class b is getting televised like last year so I can't imagine them changing this format. Also the thing about the foot print of SW region in baseball how is going to change for these towns look at Class A there are no extra teams from where majority of the teams are in SW these are the towns left playing baseball. This is just plain fact here in North Dakota towns left playing baseball are going to have to travel if they are going to have games. The same is true for any sports here in North Dakota were going to travel more because number kids in rural North Dakota are not just not here look at your schools the numbers are down and look how far apart schools are now. Also your comment the class b schools competed back in the day well times have changed kids today will not put up with just opportunity to play they want chance to win and if they don't perceive a chance to win they just will not be playing. So we end up with even less teams than we have today and end up traveling even farther. This brings to another point in your comments for majority of these towns these legion teams would not exist if there were not younger kids than 16 on them. These towns are having tough time getting enough kids to even put a team together. B-oldtimer wrote: The reason for the three classes was to bring about balance in teams competing in the state and not having larger towns dominate smaller towns year in and year out. Here in Northeast district Grafton had won the NE region like nearly every year. I am not saying there are not couple of teams that could be in upper level of class A. The towns of Langdon and Carrington have good programs but by no means do they have numbers to compete with any class AA team. Langdon legion team is made up several Baberuth players that play and start for them. Carrington is similar to Langdon with maybe a little more depth but not teams made up older kids each year they rely on younger kids to make their teams. Thompson I think is on the cusp of being class A team because of where they can draw their kids from close to metropolitan area and the depth they have shown over the last few years. This having depth and mature players is even more needed today than when they started the third class because the new rules on pitch counts has put depth primary concern for teams competing. Pitching was always limiting factor and now with pitch counts the need for more pitchers is must. The difference between class A and class b teams is the depth at pitcher where usually a lot of class b town may have up to three older experienced pitchers then you start getting to younger pitchers even to where they may even be baberuth kid pitching. The larger towns just have depth of having numbers to have depth at pitching. I have not heard of many complaints here from class b teams and they seem to like how its structured now. The complaints seem to come from the Class A teams and I believe its because being competitive division winning and going to state in not as easy accomplishment as it was when they were with combined class b and class a field. I believe it helped some smaller class b towns keep programs going because the kids feel they have chance to win where before they were just getting beat up year after year felt they had no chance. At this point I just don't see where they are going to change this tournaments are popular and even class b is getting televised like last year so I can't imagine them changing this format. I'm going to disagree with you on the difference between A and B being the depth at pitcher. I haven't seen a 16yr. old team in the A division with pitching depth. The teams with pitching depth are the teams that do a good job developing their pitchers at all levels. The class A tournament is not even close to being as popular as the B tournament otherwise it would be televised too. It is not 16 year old its 16 to limited number of 19 years old kids playing class b and class a legion baseball. For a number of class b towns its just not the this range of kids playing legion there is large number of kids playing 13 to 15 year olds filling in make up legion team. When my son played a few years ago I can ever remember there were some 12 years olds on some teams they were playing that's right little leaguers so that town could field a team. The teams that we played that were class A didn't ever have this they had kids in 16 to 19 range and kids starting were usually 17 and 18 year olds with younger kids on bench for league game . These towns could have been move to class AA and you like you said about smaller class b they would just would have to deal with it. Instead they gave them division where they could compete at have chance to play and win at there level. The big thing I see is that since then there not winning consistently like they were when they were with small class b towns and now some of them have been struggling and we here all complaints about travel and lack of attention etc. but the fact is that don't like not having the advantage they had when they were smaller class b towns. I will just be blunt they are going to have to live with it like they have told small class b towns for years. What would be wrong with combining the A and B divisions and have a 16 team double elimination tournament, similar to Minnesota. Minnesota does their tournament in 4 days. North Dakota's tournament has 8 teams and it lasts 5 days. Rivershark wrote: What would be wrong with combining the A and B divisions and have a 16 team double elimination tournament, similar to Minnesota. Minnesota does their tournament in 4 days. North Dakota's tournament has 8 teams and it lasts 5 days. 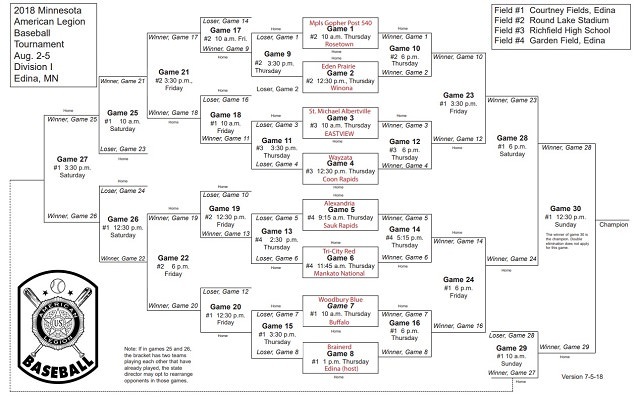 Minnesota's 2nd division is 8 teams, single elimination and done in 3 days. The top division is what you described. How hard would it be to manage pitching in a tournament like that? It's a serious question, I don't know what the pitching limits are in ND. edit: to come through the loser's bracket you would have to play 8 or 9 games. Flip wrote: How hard would it be to manage pitching in a tournament like that? It's a serious question, I don't know what the pitching limits are in ND. from the game and serve an additional game suspension. last year park river had 2 babe ruth players on their team and every year before that since they got the program back so saying that Park River had the numbers as a reason they moved up to class A is a bit off. The way it looks like this year its the same teams in class b and class a again. Carrington won 3 state titles in a row and has the same enrollment as Grafton... not sure why Park River was moved up when Carrington had that type of resume. The 3 class system has been a swing and a miss in my opinion. Not a lot of tuff competition in class A at all. Also not sure why Park River would complain... the new system made it easier to win a state a title. I don't think the top class B teams are much different than the A. The top teams in class B ( Carrington Langdon, Lamoure, Oakes Thompson Etc..) Should move up to A. To me Baseball doesn't have AS much to do with enrollment in schools as it does with Good Baseball programs at the younger levels. Maybe if the great programs in B moved up to A The other programs could grow and maybe get more kids to play? How big a town is Surrey?? Why are they class A? Surrey 1365 , Langdon 1762,Carrington 2043, Park river 1373. 2016 stats. hook wrote: Also not sure why Park River would complain... the new system made it easier to win a state a title. madseason wrote: How big a town is Surrey?? Why are they class A? Surrey is 7 miles out of Minot on Hwy 2. Their school enrollment isn’t that big however (9 man in FB) but I believe they do benefit from some Minot kids in the summer. I think you're missing the point of this post. The point I'm trying to make is there's not rhyme or reason to the current setup and it's more obvious this season than any before. Anyone that's familiar with the Thompson and Park River programs knows that these two teams should be in the same division. You can easily throw several other teams in with that group and that should be the A Division. If you want to keep all the 16 year old teams together, than put them in the B Division. When the season is over, there shouldn't be any doubt who the better teams are. It has nothing to do with being in the division where it's easier to win a title. Park River volunteered to move up to the A Division thinking that the competition would be better and that they would have an opportunity to advance to the Central Plains tournament. There were years in the past where the B Champs did not advance to the Central Plains tournament. Surrey is A I believe because they have Minot players (Class B Minot players) on the team...I may be wrong though. You are correct. I know they have Minot Ryan players, but I believe there might be an Our Redeemers player or two (that much I'm not sure of). In terms of divisional alignment, I think the American Legion throws school enrollments in there (please someone correct me if I'm wrong). So Surrey, who has a smaller school in comparison to a lot of the remaining Class B field, "benefits" from the Minot private school enrollments too. The size of the town has nothing to do with division your in even in legion its based on the enrollments of schools your drawing kids from. I know just a couple of years ago Nelson County declined to take a kid from Edmore area because if they did that it would have pushed their numbers to where they are considered a A team. The big problem is teams like Thompson who are close to major city where they can draw their team from or where people do reside in the district because advantages for their children can participate because of smaller numbers. Park River numbers increased because they gained kids out of the Edinburg/valley school area plus kids out the Adams/Fordville area pushing their numbers up. I believe they have not changed this recently so its based on the number of kids your drawing teams from. For example you Show Langdon with 1762 population but if you go to schools they are drawing there kids from you have enrollment of 171 kids in high school, Carrington town size of 2043 but kids of 169; and Park River 1365 but with Valley/Edinburg and Fordville they have 226 kids in high school. There is system of how they arrive at on these towns for what division they are from. What general public doesn't realize how much demographics has changed in last 20 years on number kids we have from these towns. Also the distance these kids have to travel to just have a team. Nelson county is prime example of this they have Towns of McVille, Tolna, Lakota, Michigan, Binford, Cooperstown, Pekin, Petersburg, Glennfield, Sutton, and McHenry and they all drive to Tolna to play baseball. Its not perfect system but I believe it has been working and I think it has kept couple of programs from folding. Too many gray areas and too many trivial issues separate Class A and Class B. One kid would separate Class A and B for a lot of teams (see the Nelson County example above). My largest problem with the 3 class system, again is the geographical footprint it leaves. More divisions means longer distances to travel in the summertime. Kids are playing less than 30 games in the summer but spending more time on busses than, say, 20 years ago - where it was not uncommon for teams to schedule 40 games a summer and the kids also did not miss out on many other summer activities at the same time. This is a recipe for reduced participation. Draw a 20 mile circle around Minot (this is my backyard so I will use it as an example).... There's the Metros, Surrey, Burlington, Velva, Renville County (Glenburn). A 40 mile circle could include Garrison and Makoti. Under the current format, there are 3 different regions represented here. Under the old system, that was a district in itself and would have been a very competitive one this year. Instead, Velva and Garrison travel to Hettinger and New Salem for District games. Surrey and the Metros go to Scobey, MT and Williston for a district game, etc, etc. That's not the case for large portion of the state and here in the NE region of the state the teams quite spread out to reach just 8 teams and the same goes for a lot of the other regions in the state. In the last 20 years in North East North Dakota teams lost are significant. We have lost Rolla, Rolette, Cavalier, Lakota, Midway, St. Thomas, Munich, and if you add a few more years on could also add Edmore, Wahalla, Drayton, and I think few more just can't think of them off top of my head. Cando closest game is Langdon 58 miles; next closest is new Rockford 66 miles, Carrington is 82 miles, Tolna is 80 miles, Minto is 98 miles, Larimore is 110 miles, Thompson is 131 miles, and finally Hatton is 125 miles. There are only three class A teams in this area of Devils Lake, Grafton, and Park River they range from 42 to miles to 80 some miles not adding a lot of extra teams or saving much distance. Langdon has similar drives as does Carrington, New Rockford, Nelson county to play games. I believe a lot of the teams in Se regions experience similar drives as does SW regions. Today kids if they compete in sports in what ever class they are in experience long bus rides the days where you could make a schedule out in 50 mile radius are long gone. I wish this wasn't the case but it is and yes its cut down on participation but fact is number of kids are way less that 20 years ago schools in our area are less than half the size they were. Here in Cavalier county to give you a little history in 1950's we had over 5000 kids in county schools, in 1970's that number had shrunk down to between 2000 to 2500 kids and now today total number kid in schools in are under 500 kids K-12 so you see what were facing here its hard to keep competitive teams. Then you add in driving time to play doesn't help and then if you add in where if your going to these larger towns getting beat year in year out that ends kids wanting to go out and compete. You may not like it but its a fact that kids today will not participate if they feel they do not have chance they will do something else. I know this I have seen it with my kids they would do something else they could excel at instead of participating in that sport or activity. I also saw this with other kids of my children's age. Also kids today playing 40+ games a year isn't going to happen because they are doing other activities and most of these kids have already completed usually 30 game season of high school baseball so they have played enough baseball for a year.